I'm sure your first thought is, that's perfectly clear. Unfortunately my group who aren't normally rules lawyers disagree. Damage Immunities: bludgeoning, piercing, and slashing from nonmagical attacks not made with silvered weapons. My reading of that is if the weapon has to be magical and silvered to hurt it. So a +1 silver dagger will hurt it, but a +1 regular dagger or a +0 silver dagger won't. The group's interpretation was that all three of those weapons would hurt and only a +0 regular dagger would be ineffective. I would also note my interpretation would mean something like blade barrier would also not harm it since you could argue they're magical blades but nothing indicates that they're silvered. This also appears to be the same wording for some undead so I'm not looking for a lycanthrope specific interpretation but something general for every time that wording is used. The werewolf's damage immunity applies to "Bludgeoning, Piercing, and Slashing from Nonmagical Attacks that aren't Silvered". Let's assume to begin with that the damage we're considering is bludgeoning, piercing, or slashing damage, since the werewolf isn't immune to other damage types. Is the attack magical? Then the werewolf is not immune to its damage. Is the attack made with a silvered weapon? Then the werewolf is not immune to its damage. Otherwise, if neither of these two criteria is met, then the werewolf is immune to the damage. Note that the werewolf is not immune to damage of these types from things that are not attacks, such as bludgeoning damage from a fall, or piercing damage from a spike trap that calls for a Dexterity saving throw. Silvered weapons are an exception to the immunity to damage from nonmagical attacks. The phrase "bludgeoning, piercing, and slashing from nonmagical attacks not made with silvered weapons" means "bludgeoning, piercing, and slashing from nonmagical attacks [except those made] with silvered weapons." To phrase it in an inverted sense as damage susceptibility rather than damage immunity, the werewolf can be damaged by magical attacks (since they aren't nonmagical attacks) or by silvered weapons (since silvered weapons are an exception), but attacks that deal bludgeoning, piercing, or slashing damage will be negated if they aren't magical and aren't made with silvered weapons. My interpretation, which is supported by other people whom I've been GMed by, is that damage "from nonmagical attacks not made with silvered weapons" refers to damage from weapons that are neither magical nor silvered. A silvered weapon, or a magical weapon, would deal damage. Your definition would be worded as "any damage from weapons that are not magical and silvered." making it clear that the item would need to be both silvered and magical. The wording is a bit strange, but maybe this visual will help. In the wolf form, the werewolf can be harmed only by silver or magical weapons of +1 or better. Wounds from other weapons heal too quickly to actually injure the werewolf. Not the answer you're looking for? Browse other questions tagged dnd-5e magic-items weapons special-materials or ask your own question. 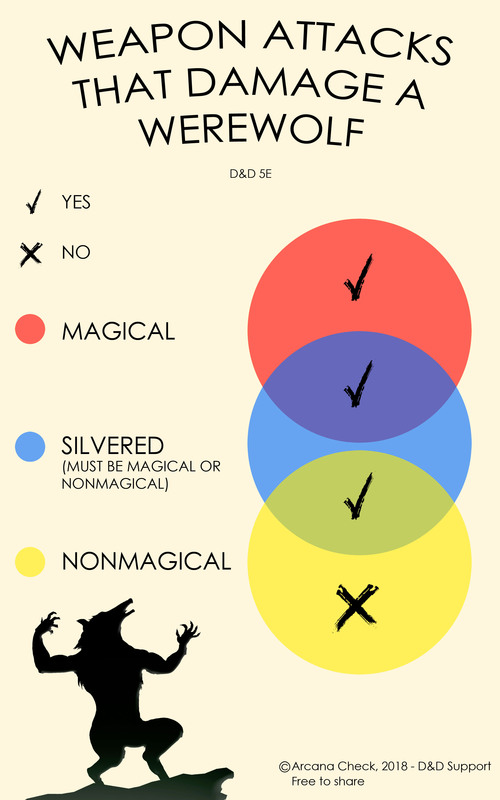 Which monsters have immunity or resistance to non-silvered non-magical weapons? Should my fighter really punch that werewolf?